Welcome to the December 2014 issue of the AXIe Newsletter. 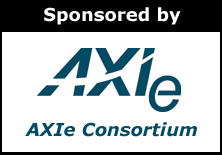 Our AXIe Consortium LinkedIn membership numbers continue to increase and we are now a community of over 332 members. AXIe is a modular instrument standard, abbreviated from AdvancedTCA Extensions for Instrumentation and Test. AXIe is often referred to as the “big brother” of PXI because, despite its much larger module envelope, it acts logically as a PXIe (PXI Express) system. Communication is performed over a 4-lane PCIe (PCI Express) bus on the backplane either through external or embedded controllers. To a controller, an AXIe system is just another PXI chassis, though one with much larger board area and power capability. Specifically, an AXIe module offers eight times the volume of a 3U PXI module, and typically can support up to 200 watts per each chassis slot compared to PXI’s 30 watts. While AXIe is well known for offering very high speed digitizers and AWGs (arbitrary waveform generators), it also excels at streaming long data records to or from these devices. Example applications include wireless communication, radar emulation and test, and electronic warfare. These long data records are typically used to search for rare or infrequent events, often in the development phase of a product or system, but also for monitoring deployed systems. If you are integrating a test system, you will need to communicate between the test system controller and the instruments. The days where GP-IB was the default choice are long gone, and five new standards now reign. For traditional instruments, GP-IB has been largely replaced by LAN, based on the LXI protocols. The strongest growth has come from modular instruments driven by PXI, but also consisting of VXI and AXIe. And you are likely to use software drivers managed by the IVI Foundation. What are these standards all about, and what are their latest status? read about the latest developments here. LXI (LAN eXtensions for Instrumentation) specifies the interface and protocols for communicating with an instrument over ethernet. It has largely replaced GP-IB as the interface of choice for traditional box instruments. With perhaps 80% of the automated marketplace still integrating traditional “box” instruments, it is not hard to proclaim LXI as the most widely deployed of all of the instrument standards. The use model for LXI is similar to that of GP-IB, as ASCII messages are sent to the instrument and back, but at GbE speeds. The similarity to GP-IB made it a natural successor, and 52 companies are now members of the LXI Consortium, offering over 2600 products. This year, the LXI Consortium has launched an effort to develop a reference design in order to decrease the barrier to entry for new vendors and increase adoption. This effort is expected to be completed by Spring 2015. Traditionally, #1 and #2 are used because NRZ data transmission is very well understood and can be realized in a cost-effective way, both on the transmit side as well as the receive side. However, there are limitations. Using a large number of parallel signals requires a higher pin-count on chips and more traces on backplanes, cables and boards, which makes the overall solution more expensive and eventually impractical. Increasing the symbol rate works well up to a certain point. But board traces have significant attenuation at higher frequencies. Depending on the length of the trace, increasing the symbol rate beyond ~32 Gbaud is very difficult. For technologies such as chip-on-glass used in smart-phone displays, the threshold is at even lower symbol rates of 1 to 2 GBaud.